Chow Chow, or Chow, is a breed of dog that was first developed in Mongolia about 4,000 years ago and was later introduced into China, where it is referred to as Songshi Quan , which literally means "puffy-lion dog." 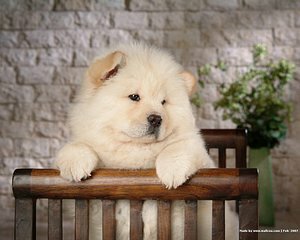 The Chow is a sturdily built dog that is square in profile with broad skull and small, triangular, erect ears that are rounded at the tip. The breed has a very dense double coat that is either smooth or rough. The fur is particularly thick around the neck, giving the distinctive ruff or mane appearance. The coat may be one of five colors including red, black, blue, cinnamon/fawn, and cream.